"We really love using the Career Charts. The simple and clear visual representation matching interests and school subject to careers, really appeals to students and opens their horizons." ﻿We have the largest collection of career posters for the education sector. Our range includes banner graphics, digital resource and print publications. We have over 130 different posters that cover more than 70 vocational sectors and 30 subject areas. You can chose your own set of career posters or chose one of our sets of 10 or 20 poster units. Take advantage of our products to enhance your displays and boost your student's knowledge with our display materials. ​​The key information on apprenticeships. How much you could earn, who are the key employers, examples of the framework and the key elements of training in a single career poster available in A3 or A2 format. The poster touches on the progression through the levels and gives good examples of current apprenticeships and the varying nature of what is available. Our poster includes the new government website for students exploring this route. What employers want poster looks at the Top 10 key employment skills that businesses need. Adapted from a range of employer surveys including the National Association of Colleges and Employers, this poster highlights these essential skills that students need to have before entering into the work place. Each skill includes 2 questions that encourage students to self evaluate if they have these skills. A strong graphic poster for display boards, offices, school libraries or student education centres. The graphic covers, teamwork, communication, research skills, technology skills, organisation, leadership, flexibility, making decisions, motivation and a willingness to learn. Available on silk , full colour, bleed printed, A3 or A2 size. This inspiration poster is explores and defines the word career. What do students understand about the world of work? Is there career an occupation, is it a passion or pursuit? How do they view it? Do they see a deeper sense of vocation in their ideas about work or is it simply a doing a job? Use this poster to engage students thinking. 19 voactional images with 11 key words. Available on silk , full colour, bleed printed, A3 or A2 size. ​ Purchase this poster and get the jpeg version for powerpoint for free! Available in a white border or black border, see image. We've highlighted the 10 major categories of interview questions for students to consider how they might respond to each one. A great poster for working with jobseekers or students who are exploring improving their interview technique or jobsearch skills. Use this for careers guidance work or in a vocational training class where your students can explore the variety of career questions they could get asked. We've also added at the bottom the different types of interview scenario's they might have to face. Available in A2 and A3 format, protrait size. This contemporary infographic covers some essential skills needed for jobseekers to find employment. The graphic touches on subjects such as interviews, cv, wrting an application form amongst others. Use the poster for jobsearch activities with a class or group or as a starter for your employment ready programme. Available on silk , full colour, bleed printed, A3 or A2 size. Designed to support your work during the National Careers Week or you own careers week, this poster aims to motivate students to consider a range of challenges with regard to careers and employability. Each challenge is given a star rating from easy to hard with 10 challenges in total. Some of the challenges can be done without any assistance but the 2 stars and 3 star challenges will need support and advice from teachers, parents or advisors. We've added a proviso at the bottom of the graphic for students to get help before commencing any 2 star or 3 star challenges. The poster is non date specific so can be reused in your next campaign or careers week. The 10 Career Challenges categories are; career research, career advice, voluntary work, organise a careers event, enterprise activity, personal challenge, poster design, dream job, informational interview and work experience. The poster is available in Red/Green or Red/blue format, A2 or A3 size. Contact us for multiple orders on this or any of our other career posters. 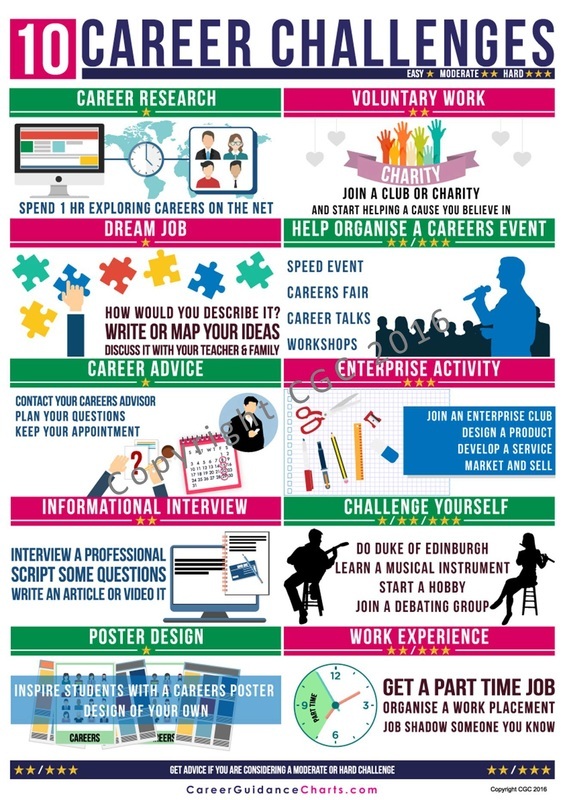 A careers poster designed to motivate students towards gaining work experience. We've list 10 benefits of doing work experience and offered 3 key bits of context. The content includes developing soft skills, building contacts, extending your network, developing personal confidence and many more. Our graphic comes in two formats, left and right listed and also left listed. The poster is available on silk , full colour, bleed printed, A3 or A2 size. for multiple orders on this or any of our other career posters contact us. Based on our research we have developed this simple graphic to explore the entry requirements for students to study at A level at 6th form and colleges. Our poster gives your students indications of the grades they need to study their chosen subject. The graphic covers 21 subject entry requirements. Printed on silk full colour bleed printed. Video interviews are on the rise and candidates need to know how to prepare for the demands of live interviews or undertaking pre-recorded ones. Our graphic looks at the practical elements for having a successful interview. Our graphic covers lighting, the tech, posture and web cam placement, dressing appropriately and mentions some of the techy companies that business and recruiters are using. n a contested job market its important for jobseekers to be aware of both the advertised and unadvertised jobs. This graphic explores the complete market following the iceberg principle that as much if not more lies beneath the surface than above. For students we consider what reasons employers give for not advertising and offer some tips on accessing this market. This poster is part of our career and employment ready series. In a hurry. No time to browse then choose your posters and checkout. How to use social media to source your next job, This set of 4 posters provides key instructions on sourcing a job through social media sources. The 4 poster set looks at Linkedin, Facebook, Twitter and Hashtag your next career. Available in A3 or A2 format.